There's too much opportunity in this country, she announced to all and sundry after she had falsely accused yet another convict of theft. People don't know when they have it good. She was a thin, scrawny woman with a beakish kind of nose. Nobody had ever seen her supposed husband, and explanations for his absence ran from he's run away to she must have murdered him with that nose of hers. Because Mrs. Sharpe prided herself on knowing all the latest gossip, Lady Theo groaned as she set off to have tea with her unwelcome guest. Mary, you can help me entertain her. It's the least you can do. Cousin Mary looked mutinous. I can't stand the woman. She wants to know every secret. I feel like making things up just so she'll go away. Sophie's Exile is the final book in Beverley Boissery's Sophie book trilogy, detailing the challenges and adventures of young Sophie Mallory. Sophie's Exile continues the story told in Sophie's Rebellion and Sophie's Treason. In the first book in the series, Sophie found herself caught in the Rebellion in Lower Canada during 1837 and 1838. In the second book in the series, Sophie and her guardian, Lady Theodosia Thornleigh, and friend, Luc Moriset, struggled to prevent Sophie's father and Marc Moriset from death at the gallows for their alleged involvement in the rebellion. In Sophie's Exile, the story continues in the penal colony of New South Wales where Benjamin Mallory and Marc Moriset have been transported as convicts. Sophie, Lady Theo and Luc travel from London to Sydney aboard HMS Swiftsail, a tiresome five month journey that sees the immigrants anxious to reach their destination. Alas, despite their desire to be near Benjamin and Marc, the new arrivals are dismayed when, before they have even disembarked, one of the first sights they see in the new colony is that of a convict chain gang, shackled together, working as beasts of burden beneath the whip of a guard. The scene is a stark reminder to Sophie and her companions that life in New South Wales is going to be harsh, particularly so for their convict loved ones. Sophie's Exile commences in November 1840, by which time Sophie is now 14 and Luc is 15. I was particularly impressed by the opening scenes in the book–the arrival of the Swiftsail in Sydney's harbour. Given Australia's physical isolation, one can imagine the interest and excitement that the rare arrival of a passenger ship would have generated in 1840. Without saying so (she does a great job of showing, rather than telling), Boissery illustrates that excitement with such things as a flotilla of boats meeting the arriving ship, including a newspaper man rowing out to greet the ship, anxious to purchase foreign newspapers. The immigrants are also able to sell their ship's clothes because, although soiled from the long voyage, the clothes reflect the fashions of London. The dock is crowded with people waiting to see the new arrivals disembark from the ship. It is a scene of excitement and curiosity, extremely well crafted by Boissery. Boissery's descriptive writing has always been a feature of the Sophie books. Twenty-nine chapters and 279 pages in length, the final instalment in the series is longer than its predecessors. Whereas the first two books tended occasionally to drag along slowly, I was pleased to note that Boissery's Sophie's Exile plot line contains many more twists and turns and unexpected surprises which help to make the story less predictable than in the first two books and, as a result, more engaging. A respected historian, Boissery has done her research into Australia's convict roots, and her knowledge of the historical and geographical setting is evident in the writing. Boissery manages to incorporate that historical and geographical knowledge into the story in a manner that provides an authentic and generally appropriately gloomy, challenging backdrop to the main story events. Boissery's characters endure a variety of trials as they are confronted by the peculiar challenges of life in Australia–the extreme heat and the women's unsuitable heavy dresses, the threat of such things as snakes and sharks, and escaped convict bushrangers. In God's name, what kind of country is it? demands Wynsham, the English butler, in disgust. Yet, later, the same butler notes the opportunities that exist for him and for others in the new land. The rules are so different here, Wynsham says. Certainly, the rules are different and, as the characters begin to look upon New South Wales in different ways, they begin to acknowledge some of the charm of the place, including first encounters with kangaroos and koalas, the eucalyptus smell of the gum trees, and the vibrantly coloured birdlife. Boissery's Australia is a land of contrasts, of beauty and of peril. For every pleasure, there [is] also the threat of danger. It would be remiss of me not to point out a peculiar error that should have been caught during the editing stage of the book's (indeed, the series') production. On page 8 and 10, Luc's surname is spelled with a double letter r as Morriset. This caught my eye because, in book 2, Boissery had spelled the name with one r as Moriset. I then flicked back to the first book in the series and saw that Boissery had originally spelled the name as Morriset, with the double r. Furthermore, as I proceeded through the third book, I discovered that, despite the page 8 and page 10 spellings, elsewhere (for instance, on page 74 and 77) the spelling reverts to a single r. Historical records often contain conflicting spellings and, indeed, immigrants occasionally changed their names or the spelling of their names. Given that the Moriset character name is a fictional product of Boissery's imagination and given the absence of any discussion to the contrary, the confused spellings in the book series are not the product of historical records or name changes but, rather, careless editing. Despite being the third book in a trilogy, Sophie's Exile can stand alone. I consider the third book to be the best in the series and, unlike with the second book, a reader can choose to read Sophie's Exile without having read the work that preceded it. The arrival in a new land is a significant departure from the previous two books. Boissery also succinctly provides whatever book one or book two details are necessary to understand and enjoy the final book. The book cover also suggests the publisher's desire for consumers to view Sophie's Exile as a book that can stand alone. 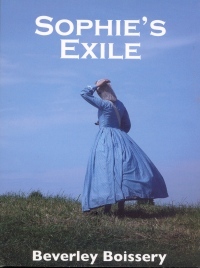 Whereas the cover images for the first two books consisted of reproductions of historic paintings from the period portrayed in the books, the cover for Sophie's Exile features a photographic image. Again including strong, complex characters, Sophie's Exile is more plot-driven and features a more engaging narrative than the earlier books in the trilogy. Middle school readers with an interest in history will enjoy Boissery's writing. Schoolteachers desiring to employ historically accurate fictional writing in the classroom will do well to consider the classroom inclusion of Sophie's Exile. Gregory Bryan teaches children's literature and literacy education classes in the Faculty of Education at the University of Manitoba.